I’m an enormous fan of Brené Brown and I’ve been re-listening to the audio version of her book Daring Greatly every morning on my drive to work. If you’re not familiar, she’s a shame researcher who has found vulnerability to be an important component of shame resilience. 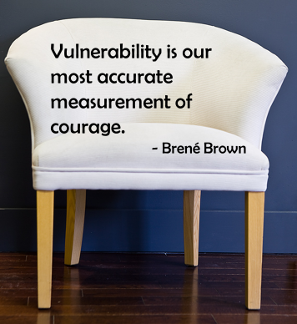 She makes the point – and I very much agree – that most people tend to think of vulnerability as a sign of weakness. However, life’s lessons have taught me that the opposite is true. Being vulnerable can be one of the greatest acts of bravery. A dear friend of mine recently suffered a tragic loss. I was heartbroken when I learned of her situation. But I noticed that almost immediately, she was reaching out to her people. Posting snippets for her social media contacts, opening up to her blog readers. Little by little she has begun to share her feelings and some insights. You would think that bearing witness to another person’s pain would be depressing. But it’s been the other way around, for me. Of course I remain sad for her. But I am also inspired by her strength and feel a sense of hope as I notice her healing taking place. But there is no dignity in suffering alone. There is no pride to be found in holding our despair close. And sparing other people seems selfish when I think about the strong bonds a relationship can develop when people weather challenges together. I believe that un-shared and unresolved hurt grows like a tumor and eventually kills us. Mustering the bravery to lay our vulnerability bare; to say: I’m not feeling strong… I’m a hot mess… this thing I’m going through is awful… gives the people who care about us an opportunity to help us heal. We all win when we create healing connections. It’s important to know that vulnerability doesn’t absolve us of having to work at it. We have to do the work of healing too. And it doesn’t mean dumping on other people as a way of lightening our load. Vulnerability is a sign that we have chosen ourselves. By choosing ourselves, we are putting stock in our ability to survive. Instead of shielding ourselves and quietly suffering to our grave. empt again and again through subterfuge, guise, and force to make you submit, quit and/or die quietly inside. But don’t, don’t, don’t. It’s a war not easily won, but if anything is worth winning then this is it. Nobody can save you but yourself, and you’re worth saving. It’s far from easy but I think vulnerability is an ingenious way of pulling yourself out of heartbreak and despair. Is that lifesaving? You bet it is. What do you think about this? Do you agree with me? Do you find it possible or impossible to open yourself to vulnerability?